Some good news today. 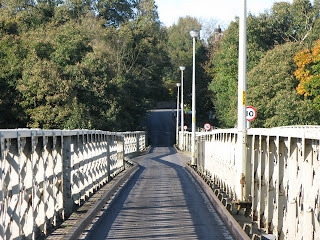 The Government have announced a £2.265 million refurbishment scheme of Ovingham Bridge. This is the news we have been waiting for and it is exactly what the bridge needs. The bridge is really important to the people in East Tynedale and in Prudhoe. After much lobbying to the Department of Transport the £2.2million scheme will provide a full structural refurbishment of the bridge and is great news for local people. I am pleased the bridge would not be widened to take heavy traffic; but the structural repairs will mean the bridge can continue to serve local residents for many years to come. There had been some concern that a lack of repairs to the 130year old bridge could have eventually seen it closed. It was orginally built in 1883 in six months by the Ovingham Bridge Co. and purchased by local government in 1944 for £5550. The full structural refurbishment of the 130 year old structure will include: * full repainting of all structural steel and girders. * Replacement of the deck slabbing to include deck panels and cross girders. * and repairs to abutments, including full waterproofing and repointing. There is no engagement, no debate, no realistic alternative simply a desire for none of what is happening. Every single budgetary cut for the last 3 years + that has been proposed is opposed. I would rather we had a nuanced debate but it is like debating with a wall. On Health yesterday there was widespread criticism but Labour would spend less and will not go back on the reforms. On Education they oppose free schools locally in Newcastle and then complain that there are no free schools in Newcastle! Looking forward to our regular catch up with the High School Heads at 11. The good news is that the Schools Minister David Laws is coming to Northumberland in July so we are making sure that the Heads get a chance to have a one to one with him. Beforehand at 10.30 I will be on Radio Prudhoe which you can listen to online at www.radioprudhoe.co.uk being interviewed by Jonny McGuigan. Saturday sees both the Charlotte Straker Hospice Fete and the Humshaugh Fete - where I am relieved of the wonderful but difficult task of judging the winner of the best cake competition: last year I tried over 12 cakes - and people wonder why I am not jockey weight anymore. The new judges will discover that the Humshaugh villagers are magnificent cooks! Both fetes are well organised and great fun and in aid of great causes. I know that you will find no finer place to find jam or marmalade than at the Humshaugh Stall - I always stock up there. They start at 1.30 in Humshaugh and 2 in Corbridge - I will try and go if I can. There is also the Hexham Regatta most of the day on the river in Hexham - you will see quality rowing. On Sunday there is another Prudhoe street party from 12-4; this event last year was a blast and I am assured by locals it will be brilliant again. You can pop in to my favourite Prudhoe cafe Il Piccollo on West Street 50 yards short of the police station for a cup of tea, cake of fancy coffee! Alternatively and also on Sunday at 3pm the local Ponteland Conservatives are laying on a wonderful Afternoon Tea at Eland Green Farm, Ponteland. All our welcome. 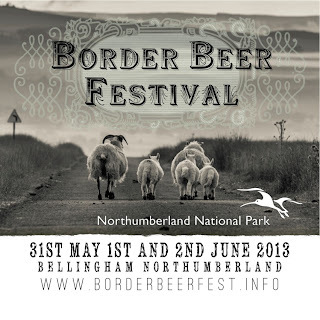 I will be there - they are easy to find - on North Road just on the outskirts of Ponteland on the right as you leave. The panel discussed all matters from integration of health and other public services, to early years intervention, bringing power back to the regions, and analysed in depths the reasons for the past and present north and south divide in terms of health. There was broad agreement as to causations ranging from historically unhealthy industries to long term unemployment issues and attitudes to alcohol, smoking and lifestyle. Many of the answers that people sought for the economic turn around are found in the Heseltine Report as to the transfer of power away from Whitehall and this years Adonis Report into the North North East, as commissioned by the LEP. I was able to plug the regional banking conference in a weeks time when we will be trying to explain and then set up local banks here in the North East to help implement the changes that so many people wanted to see, as part of an empowerment of the local economy and a return to responsible lending / growth. Great contributions from Dr Paul Williams of Stockton & David Taylor Goodby, both of whom were involved in local healthcare and CCG's. Having spent the day seeing the integration that is already happening between the North East Ambulance Service, my CCG and my Trust we compared notes / experiences of the benefits of the changes. I was able to make the point to a former Prudhoe resident that at the Ferndene NHS Centre in Prudhoe we have the UK leader in healthcare facilities for children who have significant mental health problems and I explained the great work Mental Health North East is doing. I raised some eyebrows by making the point that I disagree with the government on alcohol pricing - this has been prevented as it is seen as a tax on the low paid / poor. I counter that by arguing that these are exactly those who the state should be trying to protect. Similarly I am adamant that more needs to be done to stop supermarkets selling alcohol low price and at the checkout. Find me a single Doctor, ambulance worker and policeman who does not agree that pre loading and cheap alcohol is a serious problem and I will buy you a regulated pint in a pub -who are being starved of business by reason of the supermarkets approach. 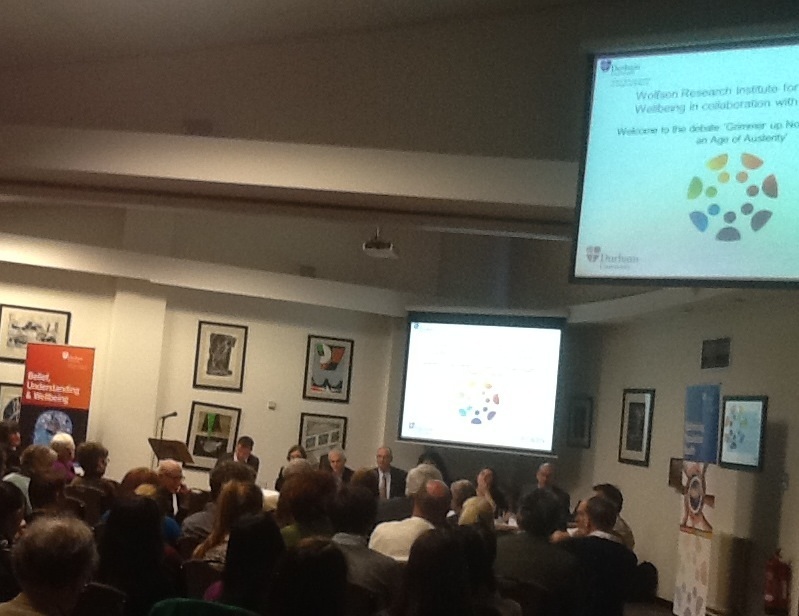 Although some in the audience were critical of the state of the Health Service most felt it was about changing priorities away from reactive medcine to preemptive medicine. All agreed government departments are not good at talking to each other and that progress on this issue was slow. We had a good discussion on the importance of specialist hospitals for specialist problems - I used my craniotomy as an example - this is not something I would have wanted to be treated for at Hexham General. One questioner called Bob asserted that government sees the state as malign - I did all I could to persuade him that this was so not the case and would go so far as to say that I have never met anyone who has said that either in or out of the Commons. My hostess Clare called for a Roosevelt style new deal of spending and other speakers called for more spending on a variety of issues. I could have pointed out that we are doing huge amounts of capital infrastructure plans both locally and nationally, that we are spending significant sums to boost apprentices and the skills agenda and did make the point that the North East economy is growing and is the only region in the country with a postive balance of payments + double the number of apprentices than were being created previously. But last night was not the time. 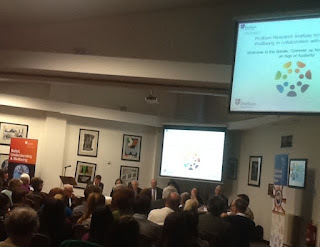 It was a well attended robust debate and my thanks to all the organisers and attendees. I have agreed to write a piece for Demos for the autumn. Yesterday morning I went to the wonderful Hexham Library, and met representatives, past and present, from the Library service, and members of Friends of Libraries in Tynedale. The library has, to the credit of the County Council, been revamped and expanded. This is on the back of new libraries in places like Haltwhistle, and an integrated facility, working with the tourist information centre, in Corbridge. When I look at the unbelievable approach of Newcastle City Council it can be compared to the support that NCC has given our library service. However, as always with civic amenities use it or lose it - there is so much more to the library than a shelf load of books, and I urge locals to make use of the amazing facility. Like many I was surprised to read in last weeks Courant that the new Labour NCC administration have possible plans to move the library to a new spot at the bus station. I will believe such a plan when I see it, and would look at the detail of any proposal, but it is hard to see why one would move the library from its central location in the town, particularly when the library has so much to offer, and could do more. There is no question that future governments and new and future county councils will look to integrate public facilities in co-located public spaces, and rightly so. My apologies to my hosts for being late, but we discussed all matters literary and more for nearly an hour and I left a lot the wiser. I have not visited the libraries that exist in Kielder and Allendale but would also urge locals to make use of this facility that is a genuine asset on your doorstep. I plan to try and rectify this omission some time this year. One final point on books: we have some wonderful independent bookshops in Hexham and Corbridge and commercial booksellers as well. Please think long and hard before you buy online. Leave aside the failure of Amazon to pay tax on its place of business ie your UK purchase, as opposed to residence -it is offshore. This flaw in the taxation system the government are trying to address [see previous blog posts]. It is simply this: if you buy online you are failing to support your local shops - which are the self same shops that we all like and admire, and which add so much to the character of our streets in Hexham and the market place in Corbridge. The consumer is king - but the consumer is you. We all must take responsibility for how we shop. My quick chat with the NFU at the County Show urging people to buy local and support our farmers. Meetings this week with all 4 Upper School Heads, a visit today to both RAF Spadeadam and Close House, surgeries with those lawyers affected by the proposed reductions in the Ministry of Justice Budget, an evening with Ovington residents, and multiple other surgeries both in the office and on the road. On wednesday I am visiting both Shepherds Dene and then the NHS facility at Prudhoe, with more meetings that afternoon with NHS providers locally. On Wednesday night I am taking part in a 90 minute debate in Durham with the think tank Demos, and a variety of the regions key health professionals on the state of the NHS and its future. Friday I have a meeting with the Chief Executive of Northumberland County Council in the afternoon. Saturday I am now working in Corbridge and seeing constituents. Tens of thousands flocked to Bywell - there was something for everyone. I must have spoken to a couple of hundred as I judged the outdoor stands and then worked behind the bar at the Haydon Hunt Beer Tent, which was the place to go for a celebratory pint as the day ended. Well done to all the organisers and everyone who took part. A great day. It's the County Show tomorrow! 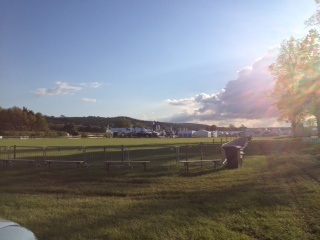 I have been at the site for the Northumberland County Show tonight, to have a look at how preparations are going - and it is clear tomorrow is going to spectacular. There is no better way to spend your Bank Holiday Monday! The show opens to the public at 9 am and closes at 6pm. Parking is free. Tickets for Adults are £12 and for children up to 16 they are just £3. Tickets can be purchased at the gate. I am judging tomorrow and hope to see you there! The show will be held at Bywell near Stocksfield - NE43 7AB. THE SHOW WILL BE SIGNPOSTED BY THE AA (YELLOW) FROM THE A69 AND A68 TRUNK ROADS. Click here to read my article in the Mail on Sunday on why we need local banks. June 7th is the date for our regional banking conference in right here in the north east. This is the first of of its kind and paves the way for local banks to be set up. Multiple surgeries this Friday, Saturday and Sunday coupled to canvassing and campaigning against the green belt housing proposals in Ovingham. Heading out for further meetings later. William Hague came to the Commons earlier this week to update the House on the deteriorating state of the dreadful Syrian civil war. MPs are united in condemning the brutality of the current regime in Syria. Many of us are also doubtful that the UK could actually do anything. Many MPs argue that their favourite spending cut has been the decision to remove our troops from front line duties in Afghanistan and to get most of them home altogether. The withdrawal from Afghanistan is proceeding as the Afghan army and police take over the role of the running of their own country, and full credit to those involved in making that withdrawal happen. I have repeatedly urged caution over Syria. - Just who are the opposition forces we wish to help? - How can we distinguish between those opposition forces who believe in liberty and democracy, and those who wish to replace one tyranny with another? - How could we ensure any arms supply went just to the people we can be sure have the right intentions? - How do you stop the regime taking the weapons on or after delivery? - How do you distinguish between the different opponents of the regime? - How do you ensure that an apparently well intentioned opponent does not come less well intentioned should he receive arms from us? - How do you get the arms into the country against the wishes of the Syrian government? The local countries around Syria are trying to resolve this very Middle Eastern of problems but I am clear that I cannot see a reason for British troops to get involved. As always the most important thing is not to make matters worse by getting involved without a plan and the answers to the above questions. Like everyone I am in shock at what happened yesterday in Woolwich. It was the arrogance that so shocked many of us yesterday. I am adamant that this mad man did not speak on behalf of all Muslims. He talked vaguely of "our lands" and what "our people" have to go through every day. He was presumably referring to the global Muslim family, but he was completely misguided. "This was not just an attack on Britain, and on the British way of life, it was also a betrayal of Islam and of the Muslim communities who give so much to this country. There is nothing in Islam that justifies this truly dreadful act." How can a couple of men so thoroughly convince themselves that they speak for all Muslims, to the extent that they seriously believe their savage and psychotic attack on a man in the street is some kind of glorious act of Islamic resistance? These mad men had no democratic right, no justification, no religious backing. I welcome the widespread condemnation by the law abiding Muslim community in this great country. It is a harsh fact that there are some bad and mad people everywhere, in every place, and in every religion, colour and creed. But these mad men do not speak for Islam, the Muslim community, or the multicultural way of life that we enjoy in this country. We should go about our business. Be as normal as is possible. Do not succumb to extremism. Although all our hearts are heavy and our thoughts and prayers are with the Army, and the soldier who died, this should not affect how we live our lives. Westminster Hall has a debate entitled "Government support for the High Street" and I will be trying to get called to speak on government action thus far and in the future, the role of the new Local Authority in Northumberland, and what all of us can do to help our High Streets. However, the ultimate future lies in all of our hands. The adage is use it or lose it, and we are all guilty of buying on the internet, convenience shopping in a supermarket and not doing our bit to help our friends and neighbours. "Ask not what your government can do for your high street, ask what you yourself can do for your high street." Doors open 9am and there are hundreds of indoor and outdoor stands, events in the arenas, stock judging, great food and it is easy to get to. This is your local show - please come and support it! Energy Bill - thoughts on a speech? In 2 weeks parliament is debating the Energy Bill, and I am inviting contributions on the content of my speech on this issue. I can think of few more important Bills going through the parliament on a multitude of levels. It addresses national issues of huge importance, and local issues that matter tremendously to the local people I try to represent in Northumberland. On the one hand is government's fundamental obligation to keep the lights on. On the other is our desire to tackle climate change. Whilst we have to acknowledge that all governments have to address declining oil reserves, the legacy that comes with nuclear power, the carbon impact of coal, the innate difficulties of fracking and the unintended consequences of using all our trees for biomass plants. Balance that with our upset in rural Northumberland that we have random applications for wind farms that are, at best, inefficient and, at worst, an expensive eye sore. Talk to the miners and there are the arguments from local Labour MPs that we need a return to more coal mining, whilst the citizens of Whittonstall and Halton Lea Gate would disagree. Add in the problems of the rising prices of the most important energy of all - the petrol / oil and diesel that runs our vehicles and heats our homes... not to mention the thousands of my constituents who are off grid and relying on unregulated LPG. Who would be the lead energy minister? In cabinet this is Ed Davey. He is a decent man, doing a very difficult job. But I have decided to take a different approach to the speech in a couple of weeks time. I am meeting on Friday 24th with a number of the representatives of the heating oil buying groups in Northumberland to try and get their specific input. Bear in mind that Mike Murray and Lauren Langton have already become the unofficial key advisers to the Energy and Climate Change Select Committee and recently Lauren met with the Energy Minister, Michael Fallon. I have specifically asked them to give me information - both for onward transfer to the Ministers and the OFT, and also for potential inclusion in an energy bill speech. Apologies to all constituents trying to track me down this weekend - I have left the office and the phone is off. Out with mates this evening then seeing family / friends tomorrow. So excited to be playing cricket on Sunday at the wonderful Wormsley ground, in an all day match for 2 charities. - and then 21 runs in my first outing 10 days ago. The North East should decide on it's relationship with Europe. I am backing James's plans for a law to legislate for an EU Referendum. Europe has changed immensely over the last few decades. Our relationship with Europe needs to change as well. Put simply, the European Union is a very different beast from what people voted for in 1975. Like many people across the region I never have had that vote. I want to see powers brought back to Britain, with greater control over our own affairs. I do not want the Euro, or for us to be part of some kind of European superstate, run from Brussels. I hope the Labour MP's in the region will back my Conservative colleague, James Wharton, the MP for Stockton South, whose Private Members Bill will put the proposal for an EU Referendum into law. law can only be put in place if Labour MP's in our region back this bill. I urge them to ignore Ed Milliband and back our plans to give the region its say on our future with Europe. Liam Byrne, Shadow Work and Pensions Secretary, has again made it clear that he will not be repealing the spare room subsidy changes if Labour won in 2015. This is not surprising. This repeal was in the 2010 Labour Manifesto. However, they decided to take the easy option in 2012-2013 to call this a bedroom tax and have a pop at the Coalition. Now they are in the interesting position of Labour still peddling the bedroom ‘tax’ lie, but not saying they would repeal it. How a working taxpayer's subsidy of someone on benefits can be a tax remains beyond me but at least all 3 parties are now agreed. Shame about the positioning these last 6 months. My former 2010 general election opponent is still struggling to sell his personalised Lib Dem number plate after deciding in a "Road to Damascus" moment to switch to Labour. Andrew is keen to stand for Labour at the next general election against me - even though his Liberal colleagues in the House of Commons are actually trying in the Coalition to solve some of the disastrous debt problems left to us by Gordon Brown. Now the BBC have taken up the story. Are some oil companies driving up prices for consumers? Yesterday in parliament we confronted one of the issues that many of us having been arguing about for some time in Westminster and in the pubs / workplaces of Northumberland. The offices of several firms involved in the oil market have been raided by EU Officials. BP, Shell and Statoil were all raided. It is early days but the investigation relates to possible price fixing of oil, refined products and biofuels. As yet, it is important to say, nothing is proven. But, I welcome the investigation. All companies are cooperating but there was an ugly atmosphere in the House of Commons yesterday. On a day when a Europe vote dominated the headlines it was ironic, but good, to see EU investigators taking up the cause of the motorist, the tractor driver and the parent trying to heat their home. I have long campaigned that something is amiss in the state of the oil market - whether it is heating oil or the domestic petrol / diesel market; but I remain frustrated that the Office of Fair Trading seem unable to do anything, despite frequent investigations. People in the north-east welcome the three-year fuel duty freeze, but we have concerns that the OFT, despite having had repeated evidence, particularly in rural Northumberland, of a lack of competition, has still failed to act. Does the Secretary of State agree that a way forward would be to summon the OFT to the House so that all MPs can make representations in his presence and get some action from it? No one has any faith in the OFT. I am sorry to hear that my hon. Friend does not have faith in the independent competition authorities. According to the empirical evidence of how they compare to other competition authorities around the world, they actually score extremely highly. Nevertheless, even though I saw those findings when I was competition Minister, I wanted to strengthen them still further, because there is no room for complacency. I hope he realises that the Government will ensure that the competition authorities have the powers they need. The newspapers feature extensive gossip about the mythical "tea room" in the House of Commons. In reality it is a 65 foot by 18 foot room where you get a cup of tea or a light meal. But only MPs are allowed there. After the Commons statement on this issue I again raised the ineffectiveness of the OFT with Ed Davey; Ed is, to be fair, a decent man doing a tough job, and was only trying to eat his lunch. I am going to try and invite the OFT in to the House so that Ministers can hear just how bad it is. If individual constituents want to make the case send their representations to me at the House of Commons and I will pass on to the OFT. Rob called on the government to change the law so that people could be jailed "for fixing oil prices" and for any cash recovered in fines, if the companies are found guilty, to be returned to motorists. I met David Laws, MP, the Minister for Education, today to discuss the ways in which Hexham's Queen Elizabeth High School can be at the front of the queue for any future money for rebuilding or improving the school - using central government money. We have successfully won the case for a rebuild of Prudhoe High School last year and it has been made clear to me by many parents, children and teachers that Hexham QEHS needs investment. Clearly these are difficult times to be pitching for further capital funds but if you do not ask you do not get. David was very helpful on this issue and made it clear that his department is conducting an assessment of all school buildings, including Hexham, this summer. From that assessment our needs will be clear and the bidding process can begin. Separately I urged the Minister to come to Northumberland and meet local Headteachers himself and see both the amazing success of our schools and the problems that they face in providing education in a largely rural context. I am hopeful that he will be visiting in the near future this summer, and will let local heads know if and when he is coming. At that meeting I know he wishes to meet with Northumberland County Council officers to discuss amongst other things the Northumberland approach to the Local Government Pension Scheme and the bizarre approach of NCC to pension contributions by schools who are academies or who wish to become academies. I again raised this today. One thing is clear - the overcharging approach of NCC is unacceptable. Ministers agree. Michael Gove, the Secretary of State, agrees. The department for Communities and Local Government agree. This unfair approach will change, and it will change soon. My Lib Dem opponent at the last election has offically left that party and joined Labour in a bit of a huff. He complains the Coalition is "drowning families in debt". He seems to have forgotten who got us into this mess in the first place - his new best friends in the Labour Party. I also distinctly remember him using the criticism at the last election that the Labour party was drowning families in Northumberland in debt. The good people of Northumberland have very long memories. On a lighter note Mr Duffield is known for his personalised number plate, proudly displaying: L16 DEM. Presumably not quite the message he wants to send out given his new loyalties. Perhaps Mr Cable might take it off his hands? I have a busy day starting in Hexham, with a variety of surgeries and then will be meeting constituents in Ponteland. Hope to pop in to Hexham market which is also on today, as is the Green Energy Fair, which is in the Trnity Church Hall in Beaumont Street, from 10-4. On Monday 13 May the Chairman of the Bar, Maura McGowan QC, and Mark Hatcher, Director of Representation & Policy, are coming in to the House of Commons to meet Robert Buckland MP and myself, and some of the other former barristers who are now in the House. Both Rob and I did plenty of legal aid work and Rob is still a working Recorder who sits in the summer. This will be the second such meeting I have held with Bar representatives in the House in the last few months. When the House breaks for the bank holiday in late May I am also meeting a number of local barristers and solicitors on Tuesday May 28 in the Hexham office. There is widespread concern about the changes on a number of levels and I have received several representations from practitioners. I am studying the consultation myself so have no firm and final views about it but it is clearly deeply unpopular with the legal profession. What is clear is that both government and the legal profession will need to find a way forward. However, the idea that there will be no cuts to the legal profession's state budget is simply untenable: government is still spending more than it earns and the state expenditure has to be cut. Noone wants this but we are having to make some very tough choices to a lot of budgets. Cases like very high cost cases [VHCC] still take up too much of the budget at the expense of the younger lawyers / cases. For myself I have long favoured a Woolf style assessment on the fees at the end of almost all cases, being carried out by the Judge. This would take out all bureaucracy, as it did so successfully at the civil bar. It would allow Judges to case manage the costs, rather than a civil servant miles from the action. However, I will look forward to meeting the Bar Chairman and listening to her and Rob Buckland MP's views, and as always welcome input from constituents who have concerns. - A single statute on care and support. - The right for carers to receive support from their local council. - A legal entitlement for everyone to a personal budget for care. - Ofsted-style ratings for hospitals and care homes. - Power for the Chief Inspector of Hospitals to identify problems with the quality of care. - A new criminal offence for providers to offer false and misleading information about their performance. - The new flat-rate pension to replace the current two-tier system from April 2016. - Bringing forward the increase in the state pension age to 67 by eight years. - A system of automatic transfers for an employee’s pension pot to follow them when they change jobs. - The Pensions Regulator will have a new objective to consider minimising any impact on the sustainable growth of employers. - The amalgamation of bereavement benefits into the Bereavement Support Payment. - The £2,000 employment allowance for every business and charity announced in this year’s Budget. - Measures to combat tax avoidance, including an extension of the General Anti-Abuse Rule, which targets aggressive tax avoidance schemes, to National Insurance Contributions. - Further attempts to stop companies avoiding paying NICs using offshore employment payroll companies. - Measures minimising the tax advantages for limited liability partnership members by ending the automatic presumption that they are self-employed when they are technically employees. - A duty on regulators of industries to consider the impact that their actions will have on growth. - Council and housing association tenants will qualify for the Right to Buy and Right to Acquire after three years, down from five. - Self-employed workers whose jobs don’t risk harming others will be exempt from health and safety law. - Employment tribunals will no longer be able to make wider recommendations following successful discrimination cases under the Equality Act 2010. - Councils will no longer need to produce assessments after designating air quality zones. - A Unified Patent Court, based in London, will introduce a single patent system across all EU countries. - Clearer guidance for businesses on what is protected under design law. The aim is that this will aid innovation by making investment in the design sector safer. Similarly design ownership will be clarified. - New criminal penalties for those who copy registered deigns. - A new design rights opinion service will settle intellectual property disputes without litigation. - Sharing of information between the UK and other patent offices on unpublished patent applications. - Consolidates eight pieces of legislation in one place. - Clarify areas where the law has fallen behind the pace of change, for example on e-books. - Easier access to compensation for those affected by breaches of consumer and competition law. More powers for Trading Standards to require businesses to compensate consumers for breaches of consumer law. - Deregulation for businesses and enhanced consumer protection. - Closes the Audit Commission. - Extends the council tax referendum provisions so that taxpayers can veto rises in council tax from local quangos. - The construction of the high-speed rail route and the compulsory purchase of land for it. - Powers for the Transport Secretary to pay for design work and surveys of the land for HS2. - Help for consumers to find the best energy tariff, including clearer and simpler information on bills. - Incentives for businesses and households to cut their electricity use. - The power for the government to set a target range for the decarbonisation of the power sector. - Makes it easier for new businesses to enter the water market and for water companies to buy and sell water from one another in order to cope with drought. - Changes to compensation arrangements for those affected by water companies abstracting water in order prevent unsustainable practices. - A scheme for people suffering from the asbestos-related cancer to receive compensation payments if their employers cannot be traced. - Bigger fines for businesses using illegal labour. - Temporary migrants must make a contribution before being able to use the NHS. - Private landlords will be forced to check the immigration status of their tenants. - Illegal immigrants will not be able to obtain UK driving licences. - Only cases raising the most important immigration issues will have the right of appeal. - Limits on the use of Article 8 in immigration cases. - Supervision after release for offenders serving custodial sentences of less than 12 months and an extension to supervision after release for offenders serving custodial sentences of 1-2 years. - Drug-abusing offenders will be required to attend treatment appointments. Offenders can be tested for Class B as well as Class A substances. - A new requirement for offenders to attend appointments or activities to support their rehabilitation. Offenders serving sentences in the community will need to seek permission before moving out of the local area. - Six powers to deal with anti-social behaviour which combine 19 existing ones. - Owning or being in charge of a dog that is dangerously out of control in a public place will be extended to private places too. - An increase in the maximum penalty for the illegal importation or exportation of firearms. - Forced marriage to become a criminal offence. - A Police Remuneration Body will replace the Police Negotiating Board. - Police and Crime Commissioners will have the responsibility of commissioning victims’ services. - Implementing recommendations from Sir Scott Baker’s review on extradition. - The Crown Prosecution Service Inspectorate will inspect the Serious Fraud Office. - The police will be able to prosecute uncontested minor offences of shoplifting. - An extension of the witness protection scheme. - Compensation for miscarriages of justice will depend on a new ‘clear innocence’ test. - Large scale changes in procurement of defence equipment. - An increase in the size and role of the Reserve Forces. About to cycle to Brixton Prison where I will be meeting prisoners and seeing the work being done to try and improve the prison's outcomes and generally rehabilitate prisoners to prevent offending on release. Then back to Westminster for the pomp and ceremony of Queens Speech, which sets out the legislation that will the Coalition will try and bring through parliament this year. There is then a debate on its contents at 2.30, which will be robust as this is one of the few times that MPs can question the PM and the Leader of the Opposition. The debate on the contents of the Queens speech is then opened up to other MPs who will debate it over a period of several days. I will be in the House until at least 10pm tonight as we have to vote then, but have to pop out of the chamber on several occasions, and will also be meeting Mark Harper, my political boss, who I have sorely neglected as a Parliamentary Private Secretary of late. Will definitely be spending more time on Home Office matters in the next few months. Prison Radio - I will be live in Brixton Prison on Wednesday at 9.45am discussing "Doing Time"
It is a while since I was last in Brixton. It is an iconic prison in London and I had clients there about 10 years ago so I will be interested to see the changes. The prison features very heavily in John Podmore's seminal work on his life as the prison governor there - a book he wrote, called Out of Sight, Out of Mind, is required reading for anyone interested in prison reform. At my desk tonight going through outstanding correspondence / catching up on emails. Tomorrow the House returns. I have meetings, in particular, tomorrow with the NHS Minister over GP contracts / revised terms and conditions. This has been particularly brought to the fore by my meetings with the Haydon Bridge GPs in April, and extensively in correspondence, but others have also raised it. As I have been up north for the Council elections my apologies if we have been a little slow responding to your emails / letters but they will all be dealt with, as always. We get over 100 letters / emails a day but try to respond to everyone. If you have not received a response within a few weeks then do not hesitate to contact the London office which deals with all the correspondence. Ponteland North - Conservative win when Richard Dodd elected unopposed by any other party - very bizarre! - Great results in the 3 tough Labour / Conservative fights of Hexham Central, Hexham East and Haltwhistle for our Conservative councillors. On a national swing all should have gone to Labour but all 3 were held by a hundred plus votes or more. - Lib Dem vote declined everywhere. Not as bad as South Shields last night where they got 1%, but in Prudhoe North it was a Lib Dem seat before this election and their candidate this time did not get 10% of the vote. A good hold for the Lib Dems in Haydon and Hadrian, but the hard work of former ambulance man Colin Cessford knocking on every door for over a year paid off in Hexham West. No canddiate has worked harder this last year. - Ponteland saw a failure by Labour to put up any Labour candidate in any of the 4 county seats, and only 1 liberal in Pont South, leaving 2 fights in east and west against Ukip on their own, which both of our star ladies won by a landslide. Ukip made little impact here. One of their candidates told me unequivocally and robustly last week that he would be a councillor on Friday, and then only polled just over 10%. - across the county the labour party have clearly made progress but the Conservatives have also won new seats in Cramlington, Morpeth North and Bamburgh. My thanks to all the candidates who worked so very hard, including the losers on the day. Noone left anything in the locker. My congratulations to the winners from other parties - Tony Reid, Eileen Burt, Anne dale, Paul Kelly and Alan Sharp - all fought good campaigns. My thanks to all the council and electoral staff, the police and everyone involved in the count. These events take a lot of managing / effort. My final thanks to all the supporters, families and friends who gave up so much time / effort for their candidates - but most of all my thanks to everyone who participated. We are lucky to have the vote - it was good that you used it. For my part, my phone is off - I am going to be sleeping a lot this weekend! Good luck to all our candidates all across the region - my thanks to them for having the courage to stick their hand up, put themselves before their community and put in the hard yards to meet the voters. Also huge thanks to all their families and friends who have had to put up with tired and campaigning candidates for several months. Last week I welcomed the 3 maths gurus from Hexham Middle School who helped convince education minister Liz Truss that the old way is best. Elizabeth Nixon, Anisha Bannister and Amy Hawke – along with their maths teacher Cath Parker – came to westminster and met the Minister after writing to me last year. The Department for Education has now ditched plans to replace the old long-division system with the modern system ‘chunking’. : “Liz Truss was very interested in what we had to say and did seem to listen to everything we said. Mrs Parker, who at 42 can certainly remember the old ways while still young enough to understand the modern, said: “When I was a child I had a maths teacher who would hit me with a ruler if I got it wrong! But this all began with the girls here in September when I was teaching long division, and Amy said ‘why have I spent five years of my life trying to divide numbers using ‘chunking’ when it’s that easy?’. “I said it was because a lot of teachers followed Government curriculum. The minister agreed to return the curriculum to “tried and tested” methods instead of the modern concept. It was a great day and the 4 ladies were very impressive.